As part of our Certified Insulation Energy Appraisals, the Fit Tight Covers team uses our state-of-the-art FLIR thermal imaging camera to take photos of piping systems, ductwork, and equipment. These photos provide accurate temperature readings of the system, with clear information regarding the amount of energy lost due to inadequate insulation, deteriorated insulation, or items insulated with the wrong material. 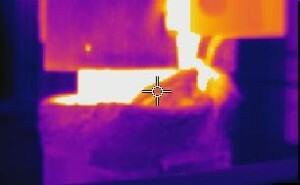 Many of these photos show heat loss that is not obvious to the naked eye. Several photos are below. Competitor’s blanket installed on high energy pipe. 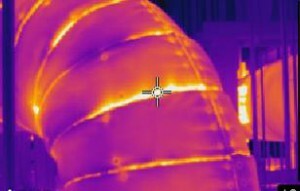 Thermal imaging shows heat escaping at the seams. Heat loss where poorly made covers falling apart. 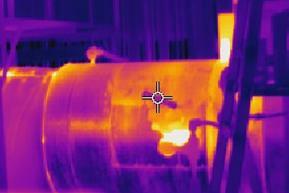 Energy loss invisible to the naked eye on another high energy pipe due to deteriorated insulation. Thermal imaging shows high energy loss.